Hailed as a resuscitation great, Dr Peter Baskett was the man who brought the role of the paramedic to the UK. He had arrived at Frenchay Hospital, aged 27, in the early 1960s and in 1966 he became a consultant, working at both Frenchay and the Bristol Royal Infirmary. Alongside his colleague and friend the late John Zorab, Peter set up the Intensive Care Unit at Frenchay Hospital in 1967, acquiring and equipping a disused ward for the purpose. But the pair’s pioneering work did not stop there, they set about improving the teaching for trainee anaesthetists and developed a course utilising the skills of fellow Bristol consultants. By 1970 Peter had started his work innovating pre-hospital care, having persuaded the ambulance service to carry pre-mixed nitrous oxide (Entonox) and working to train staff in how to use it. Training sessions were carried out at Frenchay Hospital and once there were enough a pilot study was run with the then Gloucestershire Ambulance Service with ambulances crewed with one of the new highly trained team members. 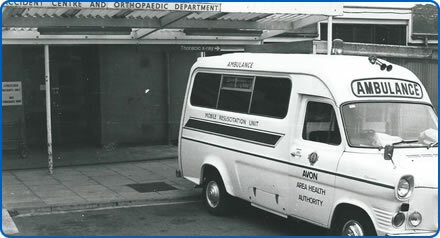 The success of this work led to Peter developing the Mobile Resuscitation Unit with Brighton cardiologist Douglas Chamberlain – the first ambulance in the UK to be equipped with facilities for administering oxygen, ECG recording and Entonox. It was based in a small, specially-built garage by the Emergency Department at Frenchay Hospital. Peter had many other professional appointments and interests including President of the Association of Anaesthetists of Great Britain and Ireland, Commanding Officer of 219 Wessex Field Hospital and motorsports doctor at Castle Combe circuit. He was also heavily involved in teaching instructors on Advanced Life Support courses throughout Europe under the European Resuscitation Council, of which he was one of the founding members. 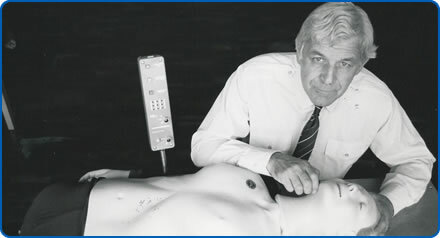 In 2005 the American Heart Association recognised Peter’s contribution by naming him a Resuscitation Giant, demonstrating the respect he gained internationally. Peter and John’s legacy continues through the busy ICU at Southmead Hospital and the senior members of the current team who worked alongside them as their careers neared an end.